After breakfast, enjoy your excursion in air conditioned car/minibus/bus in the Northern part of the Angkor Archaeological Park. On your way, you pass through picturesque landscapes with ricefields and sugar palms to another highlight of Angkor: the famous and precious Banteay Srei Temple. Banteay Srey means "the citadel of the women" and is reknown because of its incredible sandstone carvings looking like wood. It really deserves the name "diamond of Angkor". 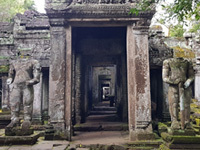 Go on seeing the most important temples on the "grand circuit"
Pre Rup is a temple at Angkor, Cambodia, built as the state temple of Khmer king Rajendravarman and dedicated in 961 or early 962. 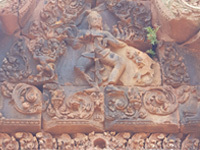 It is a temple mountain of combined brick, laterite and sandstone construction. The temple’s name is a comparatively modern one meaning "turn the body". This reflects the common belief among Cambodians that funerals were conducted at the temple, with the ashes of the body being ritually rotated in different directions as the service progressed. 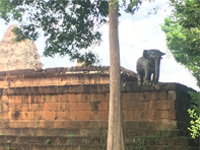 The Khmer temple of Ta Som, located at the eastern end of the Northern Baray at Angkor, was built at the end of the 12th century during the reign of the powerful Buddhist King Jayavarman VII. 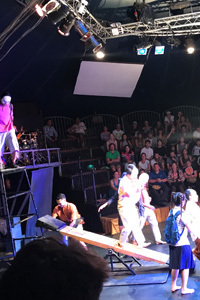 Little is known of the history and purpose of Ta Som. It was likely dedicated to Jayavarman VII’s father, although some have speculated that it may have been dedicated to one of his teachers. 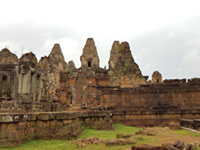 Neak Pean temple was built on the second half of the 12th century by King Jayavarman VII. 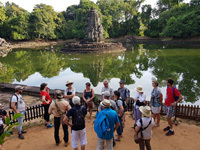 It seems that the main pond was attributed curative powers by the Angkor inhabitants and it was possibly used as a pilgrimage place where people would come and bath in order to be healed both physically and symbolically. One of the theories maintains that the pond may be a replica of the Lake Anavatapta in the Himalayas, a mythical lake at the top of the universe that is source to the four great rivers of the earth. Preah Khan temple was built in the 12th century for King Jayavarman VII. It is located northeast of Angkor Thom and just west of the Jayatataka baray, with which it was associated. It was the centre of a substantial organization, with almost100,000 officials and servants. The temple is flat in design, with a basic plan of successive rectangular galleries around Buddhist sanctuary complicated by Hindu satellite temples and numerous later additions. 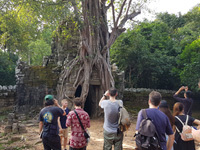 Like the nearby Ta Prohm,Preah Khan has been left largely unrestored, with numerous trees and other vegetation growing among the ruins.